There will be almost three million fewer jobs next month than in December, and this outcome reveals a lot about how the labor market works. As I noted last week, employment normally falls sharply after Christmas, for the obvious reason that consumer demand is significantly less in January than in the preceding December. Next month should be no exception. Three million is a lot of jobs – that happens to be the total number of jobs that the Obama administration contended that it had “created or saved” over the entire life of the stimulus law passed in 2009. Yet next month’s multimillion loss of employment will be largely ignored by news organizations, because it will not be much different than it has been any other January. In other words, a recession like the recent one is purported to be one of those rare times when demand is not constrained by supply. My view is that lack of demand has not been the primary problem with our labor market, which is why the stimulus law has created no visible employment increase. Because of this disagreement among economists about the roles of supply and demand during recessions, it’s important to examine whether demand was operating normally during the latest recession. If the Keynesians are right, the disappearance of Christmas demand in January would be even more devastating for total employment during a recession than it would be normally, when supply limits the effects of Christmas demand. If so, the holiday employment seasonal would be about twice as large during recessions – with January job losses in a recession of five million or six million, compared with the normal three million. 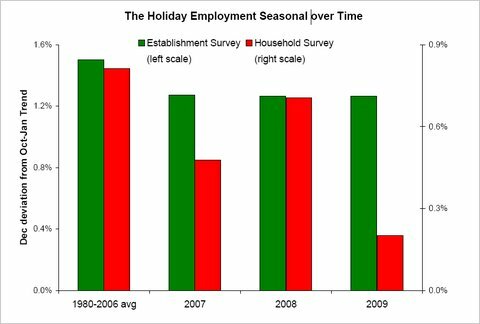 The chart below tests the Keynesian claims by comparing the holiday employment cycle across years. Each series measures the deviation of December employment from the October-January trend (Christmas shopping begins after October and is finished by January). The green and red bars measure employment from the establishment survey and the household survey, respectively, both conducted by the Bureau of Labor Statistics. Take, for example, the green bars from the establishment survey. On average from 1980 to 2006, December employment exceeded the October-January trend by 1.5 percent. During the years 2007, 2008 and 2009, the December employment seasonal turned out to be similar – about 1.3 percent, rather than the 3 percent or so that we would expect if the economics of supply and demand were really as different during those years as Keynesian economists say they are. The red bar of the household survey is noticeably lower in 2009 but well within the range observed over the past several decades. You might think that Christmas became smaller during the recession, and that change offset the purported extra impact of each dollar of Christmas spending. It is true that almost all kinds of spending are lower during a recession, but I adjusted for that by measuring the seasonal data in percentage terms. The retail sales data show that, in percentage terms, the holiday spending surge was not much different from 2007 to 2009 than it was in previous years. People can argue about whether demand effects are marginally bigger during a recession. But the seasonal cycle clearly shows a recession does not free demand – whether it be holiday demand or government demand – from the constraints of supply. "Homeowners applying to the foreclosure-relief program say the program is a bureaucratic mess, with banks losing documents and failing to return phone calls. Banks blame homeowners for failing to submit needed paperwork." This result is no surprise. With Christmas each year comes lessons about the role of demand in the economy. Retail sales are typically 15 to 20 percent higher in December than they are in September, October and November, and 30 percent higher than they are in the following January (as averages show for 1939 to 2009). In dollar terms, that means that retail sales rise and fall by roughly $90 billion in a single month. A $90 billion change in spending in a single month is larger than even the American Recovery and Reinvestment Act, the fiscal-stimulus legislation that was increasing federal government spending by about $50 billion a quarter (less than $20 billion a month). Likely a consequence of December retail spending, December employment is high each year. 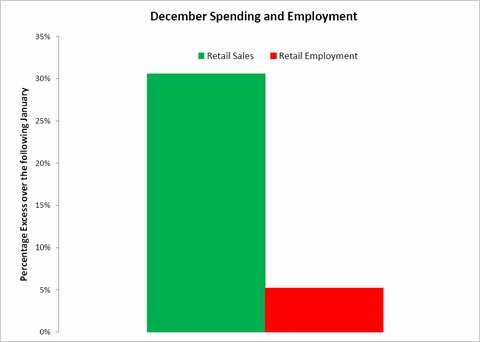 Retail employment in December is typically 3.9 percent higher than in October and 5.2 percent higher than in the following January. Some extra retail employment comes at the expense of non-retail employment, but total employment may be as much as 500,000 greater in December than in other months, because of the retail surge. Although the holiday spending surge is clearly associated with a high level of employment, it also shows how spending is a rather indirect way of creating jobs. That holiday spending of roughly $90 billion more in December is associated with about 500,000 additional jobs for a month – that amounts to $180,000 per job per month! Both Christmas and the fiscal-stimulus act increase demand, but the fiscal-stimulus act depresses supply, because many of its major programs – the unemployment-insurance extension, the food-stamp program expansion, the home buyer tax credit and more – are directed at people with low incomes. In other words, the less you work and earn, the larger your entitlement to various components of the act. By reducing supply as it increases demand, the fiscal-stimulus act could well reduce total employment, rather than increasing it as Christmas does. In any case, our experience with Christmas shows how large amounts of spending do not necessarily create large numbers of jobs. The effects of the payroll tax holiday — part of the new federal tax bill being considered in Washington — depend on the flavor, if any, of Keynesian economics that best describes our economy. Since 1983, employers and employees have each “contributed” 6.2 percent of payroll to the United States Treasury, earmarked for the Social Security program (those contributions apply only to the first $100,000 or so that each employee earns for the year). President Obama and members of Congress have proposed to reduce the employee contribution rate to 4.2 percent for the duration of 2011 while keeping the employer contribution rate at 6.2 percent. They argue, and I agree, that the proposed tax cut will increase what employees take home after taxes. Thus, if the current tax-cut proposal were instead aimed at employers, employees would still see more take home pay because employers could afford to pay higher wages. From that perspective, it’s fine that politicians are proposing a cut for employees; maybe they score some extra political points for a cut that would be more obvious to employees than an employer cut would be. However, one version of Keynesian economics stresses that our economic recovery from the recession is hampered by “sticky wages.” That is, employment would rebound more vigorously if only wages would fall, making it more economical for employers to hire. But imperfect competition in our labor market prevents wages from falling as much as would be efficient. If the sticky-wage flavor of Keynesian economics were correct, then cutting taxes for employees has less impact on employment than cutting taxes for employers would, because the employer tax cut is the only way employers will see lower hiring costs. (It may be true that the employee cut would “put money in the hands” of different people than an employer cut would, and perhaps it is also true that money in the hands of employees would do more to increase national spending. But that effect on employment, if any, is less direct than lowering employer hiring costs). I admire our labor market more than sticky-wage Keynesian economists do, but parts of the sticky-wage model are relevant for some sectors. In particular, minimum wage laws prevent wages from fully reflecting economic conditions, and those laws are most relevant for the low-skilled workers who are experiencing the highest unemployment rates. In such cases, it matters whether a payroll tax cut goes to employers or employees (Prof. Stephen Trejo of the University of Texas wrote a dissertation on this at the University of Chicago). If the sticky-wage Keynesians are right, then the employee payroll tax cut will have hardly any effect on employment among low-wage workers and will actually increase the measured unemployment rate for such groups, as they try harder to seek employment that, in 2011, would pay more after taxes. Another flavor of Keynesian economics emphasizes sticky prices for consumer goods, rather than sticky wages. In this view, prices need to fall more to stimulate demand, and only that extra demand can create hiring. Unfortunately, they contend, imperfect competition in our consumer goods markets prevents prices from falling as much as would be efficient. Sticky-price Keynesians agree that an employer tax cut would have the same effect as an employee tax cut. But both cuts have a minimal employment effect, if any, because it’s not employer costs that hold back hiring — it’s the lack of demand for consumer goods that would be there if only prices would fall. Indeed, some sticky-price Keynesians have argued that payroll tax cuts would actually reduce national employment, because more people would compete for jobs that aren’t there. In summary, the proposed payroll tax cut does not increase national employment in the sticky-price Keynesian model, regardless of whether the cut is aimed at employers or employees. The sticky-wage Keynesian model says that, because the cut is aimed at employees, it will not increase hiring in those sectors where wages are sticky — such as the market for low-skilled workers. In my view, all flavors of Keynesian economics ignore the many mechanisms that permit markets to adjust to changes in costs and benefits. Although a minimum wage cut would be an effective and revenue-free way of raising employment, the proposed payroll tax cut increases the benefits and reduces the costs of employment and will result in more employment among people earning less than $100,000 a year — even among those earning the minimum wage. We will soon be updating our paper. Economic theory suggests that marginal product of capital series might help predict economic growth forward one or two years, even under abnormal conditions such as wartime or depression. In some situations, the marginal product of capital is an essential ingredient in cost-benefit analyses (Harberger 1968; Byatt, et al., 2006; Mityakov and Ruehl, 2009). 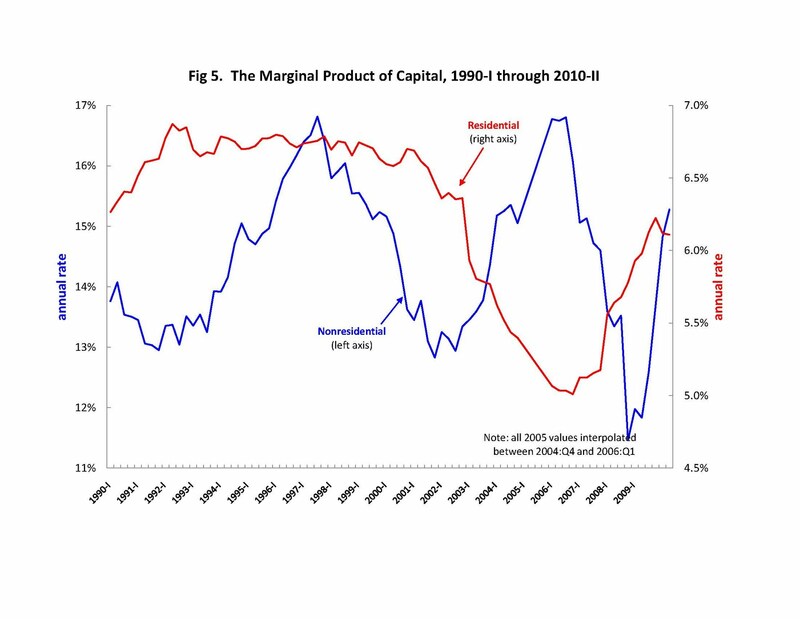 Evidence on the marginal product of capital can also help test various explanations for business cycles, help identify causes and consequences of the recent housing “bubble,” and help quantify the economic burdens of business taxes. The purpose of this paper is to produce annual and quarterly estimates of the marginal product of capital (net of depreciation), one each for the residential and nonresidential sectors of the U.S. economy. By definition, the marginal product of capital net of depreciation is the change in net domestic product (NDP) during the accounting period (e.g., one quarter) that would result from an increase in the beginning-of-period capital stock of $1 worth of capital, holding constant the total supply of all other factors. The additional $1 of capital is assumed to have the same composition as the rest of the capital stock. For example, if the economy’s capital consisted of 400 identical structures and 100 identical vehicles, each of which cost $2 to acquire, then the marginal product of capital would be the extra NDP attained by starting the quarter with 400.4 identical structures and 100.1 identical vehicles (that is, $0.80 worth of structures and $0.20 worth of vehicles). Suppose that origins of the current recession could be traced back to limits on the supply of aggregate investment due to a “credit crunch.” (Real investment did fall through the first year and a half of this recession.) The credit crunch theory says that the marginal product of capital would rise over this period as a consequence of the increased cost of capital faced by those with new capital projects. 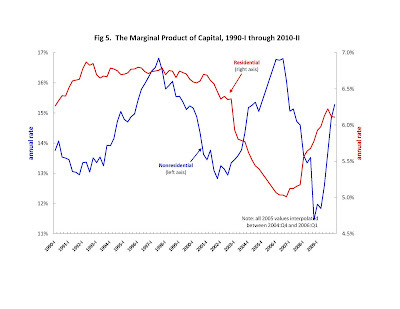 Alternatively, a financial crisis or something else could reduce labor usage more directly, and, given the complementarity of labor and non-residential capital in production, a fall in non-residential investment would merely result from low marginal products of capital, thereby putting the non-residential capital stock on a path that is consistent with a lesser amount of labor usage (Mulligan, 2010). The marginal product of capital is also interesting as an aggregate leading indicator of business conditions, which is the motivation for its use in a number of studies (e.g., Feldstein and Summers (1977), Auerbach (1983)). This relationship alone may make it a predictor of subsequent economic growth. Additionally, Fisherian consumption-saving theory suggests that the marginal product of capital, or variations of it, should predict consumption growth. In a Robinson Crusoe economy, the consumer would save for the future by reducing current consumption and using the proceeds to build capital assets. She would then use the marginal product and capital gains from those assets to add to consumption in the future. Because the saving decision is made in the present while the principal and interest are spent in an uncertain future, the incentive to save depends on, among other things, the expected marginal product and expected capital gains. The current marginal product itself helps predict the incentive to save only to the extent that it is closely related to the expected sum of future marginal product and capital gains. For this reason, we present measures of the marginal product that might be more indicative of those expected gains, and (consistent with national accounting practices: see Fraumeni, 1997) measures of depreciation that reflect expected depreciation and ﻿obsolescence, rather than actual depreciation and ﻿obsolescence. It is helpful to examine the marginal product of residential capital separately from the marginal product of non-residential capital for at least two reasons. For one, the aggregate demand for labor is expected to have a closer relationship with the stock of non-residential capital than the stock of houses, because workers use non-residential capital in doing their jobs. Additionally, some important capital market distortions – such as business taxes and the “housing bubble” – are expected to have opposite effects on the stocks of residential and non-residential capital, and thereby opposite effects on their marginal products. Section II presents our methods for calculating annual marginal products, and discusses the findings for 1930-2009. The marginal product of capital is very different in the residential and non-residential sectors, both in terms of levels and fluctuations. Section III examines the importance of taxes in explaining the gap between marginal products in the two sectors. The methods and results for quarterly postwar marginal products through 2009-IV are presented in Section IV. In order to isolate some of the possible determinants of measured marginal products, Section V compares them with average products. Section VI concludes, and Appendices record the time series values discussed in the body of the paper. Who Gets Paid by Big Government? One of the myths of big government is that most of its spending goes to the poor. 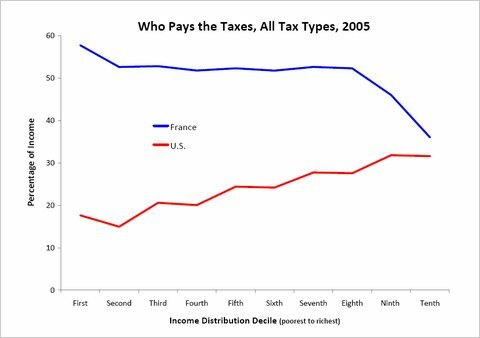 Last week I examined tax payments by income distribution decile in France and the United States. France’s bottom decile (the 10 percent of French households with the lowest incomes) paid more than half of its income in various taxes, compared with less than 20 percent paid by America’s bottom decile. France’s top decile is taxed at a rate that looks more like the rate in the United States – less than 40 percent. Taxes help finance, among other things, government transfer payments and other social-welfare expenditures like medical spending. These payments are more generous in France than in the United States, and some of them are received disproportionately by low-income people. But there are two reasons we cannot immediately conclude that low-income people get their money’s worth from big government that, as in France, takes more than half of their income in various taxes. First, much social-welfare expenditure goes to the elderly, in the form of public pension benefits and medical spending. Some of the elderly are poor in every sense of the word. Others receiving medical and public pension benefits are only technically poor (by the definition of the tax incidence studies I cited two weeks ago), because they no longer generate income on a job, but enjoy above-average living standards (which they afford by owning their own homes and receiving pension payments from their former employers). Indeed, the fact that someone has been able to live until her or his elder years may itself be evidence of some amount of affluence: good health is something enjoyed disproportionately by higher-income people. Public pension benefits have been so generous in France that the elderly have obtained a disproportionate share of the nation’s labor income through the pension system, while France’s young people did a disproportionate amount of the labor. The amount of public pensions paid has exceeded one-fifth of the nation’s labor income (and this does not even begin to count any private-sector incomes received by elderly people), even when France’s elderly were less than one-fifth of the population. As a result, the average elderly person in France has a better living standard than the rest of its population does. Even in the United States, the elderly poverty rate is below the poverty rate for other adults and below the poverty rate for children (see page 16 of this Census Bureau publication). This is not to say to say that the elderly do not deserve their public pension payments, for which they worked many years. But it is incorrect to characterize many payments they receive as payments to poor people (for this reason, a few economists have attempted the difficult exercise of relating taxes and public spending to people’s lifetime incomes). Second, taxes and transfers cannot be simply subtracted to determine the net position of the poor and other groups vis-à-vis the public treasury, because the government benefits often come with strings attached — that is, because the government spends poor taxpayer money in different ways than the poor would spend it themselves, government spending is less valuable to them than the equivalent number of dollars they may have paid in taxes. That’s why the taxes being paid are that much more burdensome on the poor — snatching money from people trying to pay their bills. Big government is taking money from people when they need it most; what consolation is the promise that government will help out later in life? Big government leaves both poor and rich taxpayers with less to spend on themselves, and more to be spent at the discretion of big government. Who Pays for Big Government? President Obama’s bipartisan National Commission on Fiscal Responsibility and Reform meets today and is expected to release its final recommendations soon on balancing the federal budget. Progressives hope that the federal government will raise revenue mainly, if not exclusively, by levying taxes on wealthy Americans. But a comparison of France and the United States suggests that raising tax revenue will ultimately involve increasing tax rates on the poor much more than they would be increased on the wealthy. Because the federal individual income tax is “progressive” — the tax is collected at higher rates from higher-earning groups — it is easy to assume that big government involves high tax rates on wealthy taxpayers without commensurately high tax rates on poorer taxpayers. However, the individual income tax brings in only a minority of government revenue. According to the Organization for Economic Cooperation and Development, most taxpayers in Western European countries — countries known for their relatively generous welfare states — pay a smaller fraction of their income in individual income tax than Americans do (to view the O.E.C.D. data, click here, then on the “tax” pull-down menu, click on the second item, “Of individuals”). Because the individual income tax is one of the few truly progressive taxes, and other taxes are regressive, the overall tax systems in Western Europe may not be as progressive as you might think. For a specific example, consider France, where taxes are 43 percent of gross domestic product, compared with 26 percent in the United States (as I noted in last week’s post, I look at 2005 and exclude "miscellaneous" taxes and fees collected by state and local government, but include all other taxes such as payroll taxes, state sales taxes, property taxes, and state income taxes). The chart below shows my estimates of the income shares paid in taxes across French income deciles (blue) and across income deciles in the United States (red). For example, France’s bottom decile (the 10 percent of French households with the lowest incomes) paid more than half of their income in various taxes, compared with less than 20 percent paid by America’s bottom decile. France’s top decile is taxed at a rate that looks more like the rate in the United States — less than 40 percent. The chart suggests that if the United States were to move to a French-style tax system, low-income Americans would see their tax rates more than double. High-income Americans would see their rates go up, too, but proportionally less. To derive these results, I used calculations from the Congressional Budget Office for individual income and payroll taxes and rescaled them for France to reflect the differential importance of those taxes to collect revenue in the two countries. For state and local taxes in the United States, I used the calculations of the late Joseph Pechman (discussed in last week’s post). For the French value-added tax, I assumed that the income incidence was the same as Professor Pechman calculated for the state and local sales taxes. I assumed that capital taxes in both countries are ultimately shifted to workers and consumers, and therefore have the same incidence as sales taxes (as I discussed last week). It’s difficult to know the exact results for either the American or French tax systems, but it is clear that the two countries have very different tax mixes, with the French mix heavily skewed away from the kinds of taxes that might be progressive. France’s individual income taxes, which are progressive like ours, bring in less than 4 percent of its G.D.P. to public treasuries, compared with 10 percent for individual income taxes in the United States. The regressive payroll tax is France’s biggest tax, bringing in more than 17 percent of G.D.P. (plus another 4 percent from its flat-rate “contribution sociale généralisée”), compared with the 6 percent of G.D.P. the United States gets from its payroll tax. Customs, excise and sales taxes amount to 11 percent of G.D.P. in France, but only 4 percent in the United States. With three of France’s regressive and flat-rate taxes amounting to a combined third of French G.D.P, not to mention the other taxes, it seems that low-income French have to be paying close to half of their income in various taxes, much more than low-income Americans do. For these reasons, I am not the first to conclude that the taxes used by big governments are less progressive, and perhaps even regressive. In a study published in 2005 that focused on the top-income decile (and unfortunately was limited only to the federal direct taxes), Professors Thomas Piketty and Emmanuel Saez noted that “countries in which government spending is a fairly high share of G.D.P. have always relied on a mix of taxes” with less progressivity. Another study by Professors Monica Prasad and Yingying Deng, who used a different methodology, found the United States tax system to be the most progressive out of a sample of 13 countries. Big government is no free lunch, even for the poor.